On 6 March 2017, at the International Weapons Exhibition (IWA) and Outdoor Classics 2017 trade show in Nuremberg, Germany, FACE, The Federation of Associations for Hunting and Conservation of the EU, and the Electronic Collar Manufactures Association™ (ECMA™) strengthened their collaboration and called for greater harmonization of legislation concerning ECMA’s™ industry. 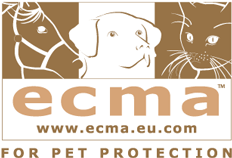 With great fragmentation caused by inconsistent national approaches in the EU, ECMA™ members and dog owners are unable to benefit fully from the EU Internal Market. ECMA™’s President, Edward Phelan, highlighted the industry’s commitment to the development of innovative products such as user guides that enable effective and reliable animal training while protecting their welfare. He also referred to the substantial investments being made into research and development to constantly improve the effectiveness and safety of the products. Ludwig Willnegger, Secretary General of FACE, stressed that there is long-standing bond between hunters and their dogs since the dawn of time. Well trained dogs are a key component of hunting and FACE welcomes the wide range of products available, but is concerned about the unjustified restrictions in some national markets.